CHICAGO – In the latest HollywoodChicago.com Hookup: Film, we have 30 pairs of advance-screening movie passes up for grabs to the new animated comedy “Sing” starring Matthew McConaughey and Seth MacFarlane from the creators of “Despicable Me”! 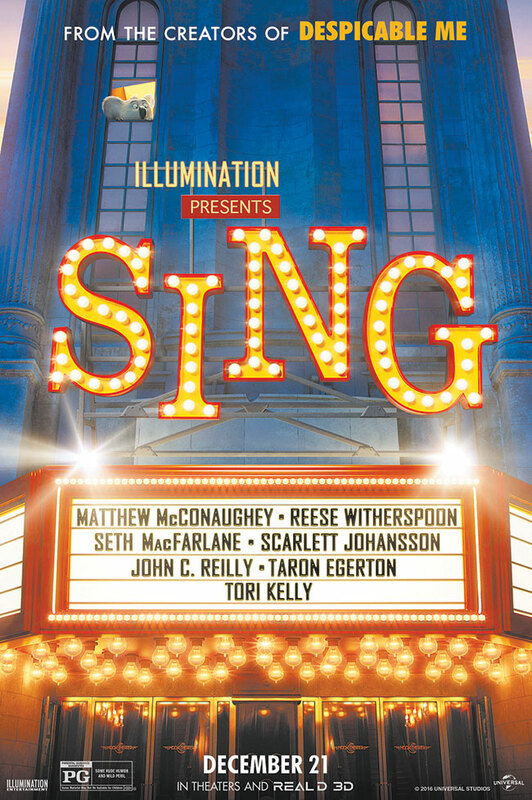 “Sing,” which opens on Dec. 21, 2016 and is rated “PG,” also stars Reese Witherspoon, Scarlett Johansson, John C. Reilly, Taron Egerton, Tori Kelly, Nick Kroll, Nick Offerman and Jennifer Saunders from writer and director Garth Jennings and director Christophe Lourdelet. To win your free passes to “Sing” courtesy of HollywoodChicago.com, just get interactive with our social media widget below. That’s it! This screening is on Monday, Dec. 19, 2016 at 7 p.m. in downtown Chicago. The more social actions you complete, the more points you score and the higher yours odds of winning! Completing these social actions only increases your odds of winning; this doesn’t intensify your competition! Deadline: Entries can continue being submitted through Monday, Dec. 19, 2016 at 10 a.m. CST. These Hookup winners will be awarded via e-mail that night. Illumination has captivated audiences all over the world with the beloved hits “Despicable Me,” “Dr. Seuss’ The Lorax,” “Despicable Me 2” and “Minions,” which is now the second-highest-grossing animated movie in history. Following the release of this summer’s comedy blockbuster “The Secret Life of Pets,” Illumination presents “Sing” this holiday season. With its highly relatable characters, heart and humor, the first collaboration between writer/director Garth Jennings (“Son of Rambow,” “The Hitchhiker’s Guide to the Galaxy”) and Illumination founder and CEO Chris Meledandri marks the sixth fully animated feature from the studio. The event film stars Academy Award winners Matthew McConaughey and Reese Witherspoon alongside Seth MacFarlane, Scarlett Johansson, John C. Reilly, Taron Egerton and Grammy Award-nominated Tori Kelly. Set in a world like ours but entirely inhabited by animals, “Sing” stars Buster Moon (McConaughey), a dapper koala who presides over a once-grand theater that has fallen on hard times. Buster is an eternal – some might even say delusional – optimist who loves his theater above all and will do anything to preserve it. Now faced with the crumbling of his life’s ambition, he has one final chance to restore his fading jewel to its former glory by producing the world’s greatest singing competition. Each arrives under Buster’s marquee believing that this is their shot to change the course of their life. As Buster coaches each of his contestants closer and closer to the grand finale, he starts to learn that maybe the theater isn’t the only thing that is in need of saving. Featuring more than 65 hit songs, “Sing” is produced by Meledandri and his longtime collaborator Janet Healy. Together, they have produced all of Illumination’s films since the studio’s inception. The movie poster for “Sing” starring Matthew McConaughey and Seth MacFarlane. This HollywoodChicago.com Hookup is simple! Just get interactive in our social media widget above. We will award 30 admit-two movie tickets based on social entry numbers and/or randomly via e-mail for our “Sing” Hookup. Good luck!